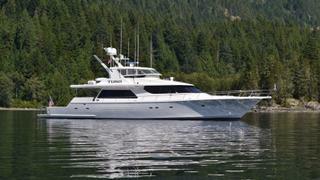 The 28 metre motor yacht Tuko, listed for sale by Todd Rittenhouse and Kevin Kramer at Northrop & Johnson, has been sold with Hampton Yachts introducing the buyer. Built in GRP by US yard Westbay Sonship to a design by Jack Sarin, Tuko was delivered in 2004 as a raised pilothouse model and has had the same owners since new. Accommodation is for six guests in three cabins comprising a full-beam master suite, VIP suite and a twin, all with entertainment centres, television screens and en-suite bathroom facilities. A further en-suite twin cabin sleeps two crewmembers. The saloon features a large U-shaped sofa, coffee tables, full entertainment centre, wet bar, custom glassware display case, and abundant storage space. Forward up several steps is the raised pilothouse, shared with an open galley and a settee with dinette for casual meals. The aft deck cockpit is fully equipped for fishing, offering a live bait tank, storage hatches, six rod holders and eight stainless steel rocket launchers, while the flybridge comes with everything needed for al fresco entertaining. Amenities on this deck include twin helm chairs, an L-shaped settee, dining table, barbecue grill, ice maker and a hard top with Isinglass screens used when the weather becomes poor. Twin 1,350hp MTU diesel engines power her to a top speed of 28 knots and she is fitted with Wesmar zero-speed stabilisers.